I'll start: "Love at home"
Love at home was my first thought too! Love at Home was the only thing I could think of!! I love both of your captions, Jana. Nice job. You guys have sure had your fair share of snow this year. Hope you're staying safe and warm. My daughter has sent me lots of videos and said it's rare for Twin to get so much snow. Crazy! My daughter's hubby is the theater teacher at Canyon Ridge (They just did Little Shop of Horrors) and she said even the high school had snow days and even had to close down one day because of the flooding--and evidently they rarely close. My daughter does have a basement, but luckily it has not flooded so far. I hope things get better for you all very soon. People have told my daughter that this is very rare for Twin. Be careful out there! Congrats, Linda! Love holds our home together. This picture reminds me of the movie Up! I can totally see that Christy. Love that movie. I can see that too, Mary. The beginning of UP makes me cry every time. Great movie. And I love your caption, Christy! Beaming my heart to you! It does look like the heart is being beamed up to someone, Karen! I love that caption! Such a perfect saying and such a perfect caption for this image. I love it, Rita! Safety measures in play re: the Big Bad Wolf. 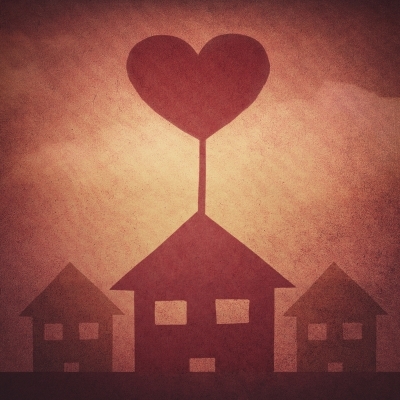 With love, a house becomes a home. Hahahaha! I love the Big Bad Wolf caption. That cracks me up, Mary. Very clever. I love your second caption as well, but that first one is fantastic! Love is where you heart lies. Both are wonderful captions, Quilt Lady. Nicely done! The Home is the Heart! Congratulations Linda! Hi Linda! I'm so glad you joined us again for WW! Thank you all and thank you Taylor. Such great answers this week, it's hard to think of a new one. Our home is overflowing with love!! I LOVE your answer this week as well. Love shack! A little old place where we can get together. LOL That song just popped in my head. Now, why didn't I think of that? I love that song. It's perfect, Laura! I love it. Two fantastic captions, BN. I love them both. Love makes our home a heavenly place to be. I love all of those captions and I especially love the meaning behind each of them. Nicely done, Britney! I love, love, love, "There's no place like home." Love the movie, love the saying, and I love it for this image. Great job, Natalie! You can't contain my love. I love both captions, Sherry, but I especially love, "You can't contain my love." So perfect!